Winning or losing in sports should not include losing one’s teeth in the process. The National Youth Sports Foundation for the Prevention of Athletic Injuries reports, “dental injuries are the most common type of oral facial injuries sustained during participation in sports.” The lifetime costs of traumatic injuries to teeth can be significant. The cost of a properly fitted mouthguard, on the other hand, can be a very good investment. Mouthguards may help prevent injury to the mouth region, especially to the teeth, lips, cheeks, and tongue. According to Sports Dentistry, injury to the teeth is 60 times more likely in athletes that do not wear mouth guards. Besides preventing dental injuries, mouthguards can reduce the chance of concussion from a blow to chin or jaw fractures. Therefore, even athletes who use helmets or face masks should wear mouthguards. There are three types of mouthguards that vary in cost, fit and comfort. Consult with your dentist to determine which mouthguard is best for you or your child. Custom-fit mouthguard: This is a customized mouthguard where a dentist takes an impression of the teeth and a dental lab makes the mouthguard. Although this type of mouthguard may cost more, children may be more likely to wear one that fits better, is more comfortable, and may also protect the teeth more since it is designed to fit the athlete’s mouth exactly. Boil-to-fit mouthguard: Made of a thermoplastic material this type of mouthguard is usually softened by immersing it in hot water. It is then shaped to the teeth by using finger, tongue, and biting pressure. This type of mouthguard may not fit as well as the custom-made version. Self-adapted (boil-to-fit) models are available in sport stores. Stock mouthguard: The stock mouthguard is constructed of rubber or polyvinyl material and comes in several shapes. However, because little can be done to adjust its fit, it may be uncomfortable and can potentially interfere with breathing and speaking. Stock mouthguards are also found at most sport stores. After each use, rinse thoroughly with cold water. You can also use mouthwash or toothpaste and a toothbrush. An occasional cleaning with cool, soapy water is recommended. Be sure to rinse the mouthguard thoroughly. Store in perforated container to promote air circulation. High temperatures may damage mouthguards. 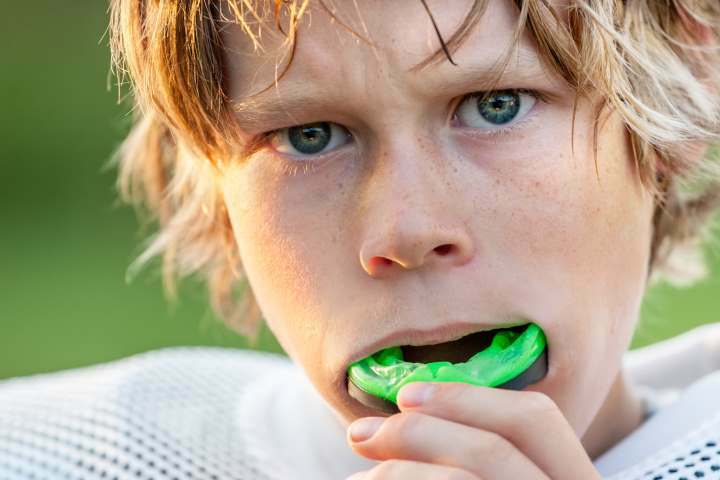 Try to keep mouthguards away from direct sunlight or hot surfaces. Check the condition of the mouthguard from time to time to see if it needs replacement. Tears and perforations can irritate the teeth and mouth tissues. These conditions also diminish the amount of protection the mouthguard can provide on the playing field. Braces may require a mouthguard for lower as well as upper teeth. Remove orthodontic retainers or other removable appliances during contact sports. Mouthguards can be an easy way to protect an athlete’s smile from serious injury. It is a good idea to get your child used to wearing a mouthguard at a young age so they can get in the habit of protecting their teeth for a lifetime. ← What is your advice regarding breastfeeding and having dental work done involving amalgam silver fillings?